Nathan Powers, 3, offers his father, Adam Powers, a flower while he talks with campus representatives at the Spring Fair at Evergreen State College's Tacoma, Wash. campus on May 19. Powers, of Des Moines, Wash., works at a nonprofit and is considering going back to school. 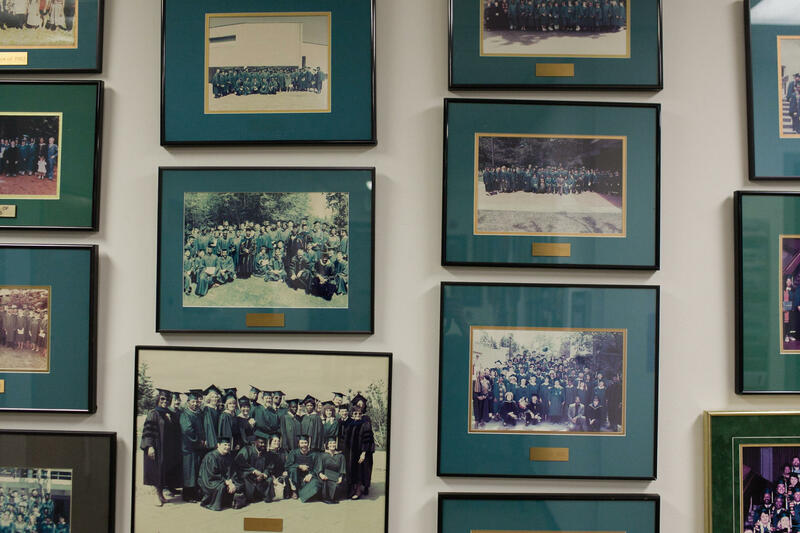 Old Tacoma Program graduation photos hang at Evergreen State College's Tacoma, Wash., campus. Maxine Mimms started the program in 1972. 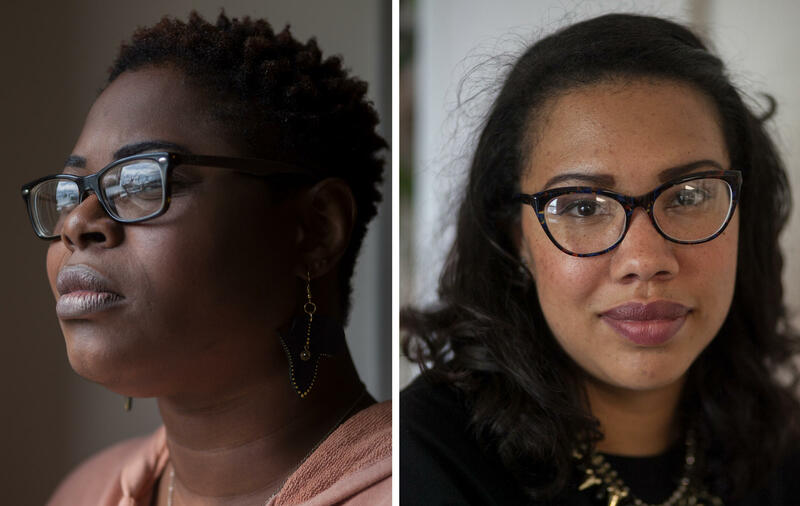 Keyona "KeyKey" Lewis (left) is in her third quarter at Evergreen studying politics; Natasha Lemke is studying communication and sociology through a social justice lens, and plans to pursue her master's in public administration. Shari Douglass explains her homelessness resources project at the Spring Fair. 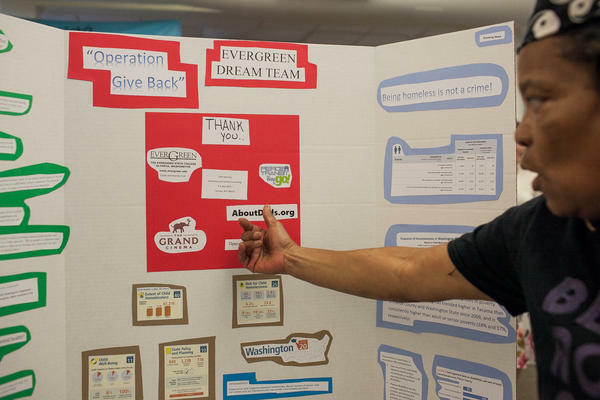 Douglass and her team created resource kits, which they distributed to Tacoma's homeless population. Kirby Christopher says meeting the Tacoma Program's students and professors changed his life. 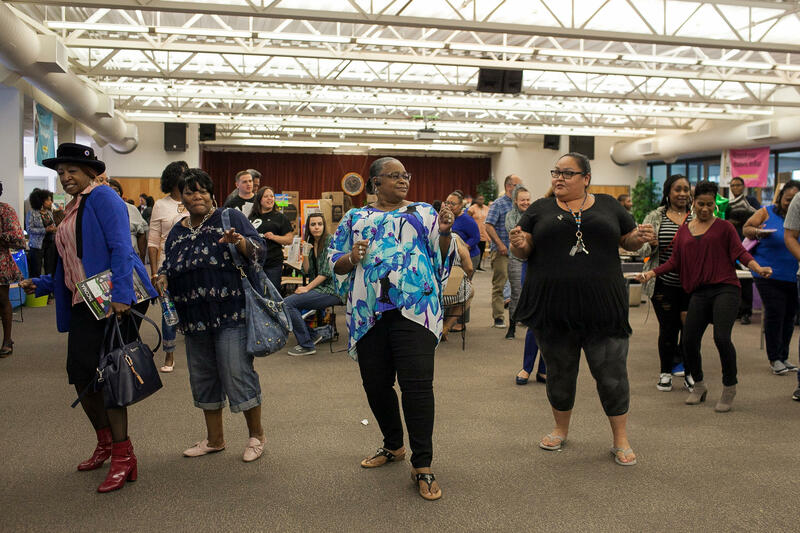 Students, teachers and community members break into the "Electric Slide" during the Spring Fair. In the U.S., more than 4 out of 10 undergraduate college students are above the age of 25. When people talk about these adult students, you usually hear words like "job skills" and "quickest path to a degree." But for more than four decades, a special program in Washington state has sought to offer much more than that. It's called the Tacoma Program. Back in 1972, Maxine Mimms, a professor at The Evergreen State College, created a new kind of college at her kitchen table, designed to serve students who are starting over in life, and to give them access to deep, transformational learning. When we drive up to the tiny, strip-mall campus in Tacoma's historically black Hilltop neighborhood, Mimms greets us wearing a headdress, a robe, a necklace, bracelets and rings crowded with gemstones. She offers us coffee and takes a deep breath, then launches into her story. Mimms started this college by teaching students in her home from 5 a.m. to 8 a.m., before driving to her job at Evergreen's main campus in Olympia. "I knew it in my heart," she says, "knew it in my spirit that it would work, that it would be successful, because I didn't start with brick and mortar. I didn't care about the building." Eventually, the Tacoma Program became an official campus of The Evergreen State College. Mimms is retired now. When she turned 90 this spring, hundreds came to the celebration. Oprah sent her flowers. This year, the program has more than a 130 students. They come for about two years, during the day or at night, to finish up a bachelor's degree they started someplace else. There's also a master's program in teaching. The average age for undergrads is 38. Most are women and people of color. The program estimates between 10 and 20 percent have been involved with the criminal justice system. And there's a special program about to launch for Native students. "This campus is about access. Access for the black and brown student to get a college degree," says Mimms. "I don't believe in any negatives. I believe that every black person born in America is a genius and brilliant." Evergreen is known for progressive, independent learning. Students in the Tacoma Program design their own courses of study to address problems in society, like homelessness or mass incarceration. It's both supportive and challenging. And the model is working. A 2014 study showed that, for returning students nationwide, just 1 in 3 earned a degree after several years. Evergreen Tacoma students do much, much better. Over the last decade, 4 out of 5 have eventually gotten their diplomas — two-thirds within the first two years. Of the Class of 2015, 91 percent were employed or in graduate school or a professional program one year after graduating. Of those, 18 percent were both employed and in graduate school or a professional program. Like Anthony Norman, 44, who owns a construction business. He just graduated and hopes to earn his Ph.D. in public policy and development starting in the fall at Tuskegee University in Alabama, a historically black university that has forged a relationship with Tacoma. "The subject matter here — it put me on a path so that I could observe that the things that happened in my life, to myself, to my family, were more than just a series of unfortunate circumstances," Norman says. For example, he mentions that he, his father and his brother have all been shot. His studies made him more aware of structural patterns of inequity. "When you can look at the intricacies of things, you can try and see closer to the root of the problem. Rather than just cutting down a blackberry bush that keeps growing, you can actually dig down there and get the root out." "Here, we think of teaching and learning as helping to facilitate students' sense of self," says Gilda Sheppard, the director of faculty and a sociologist and filmmaker. Almost everyone fits in the auditorium, which is set up like a high school science fair today with folded cardboard displays. This is the spring fair, where students present capstone projects that are meant to benefit the community. A sign reads, "ALUMNI PANEL; ART THERAPY; HUG AND MORE." Children ride on shoulders; aunties and grandmas dance the "Electric Slide." The city's mayor, Victoria Woodards, stops by to congratulate the graduates. Norman, who gained video skills in Sheppard's class, is filming. Precious Yarborough is a 28-year-old doula, lactation educator and mother of five. Her graduating project is the Puget Sound Birth Professionals of Color, a group she founded to connect people in this area with support for healthy births. Yarborough often brought her youngest son to class. "All the students have held my baby at least a couple of times," she says. She, like others, tell us what really stands out here is the mutual support. "The students around you are more like teammates than classmates," she says. If you miss class, you'll likely get a few text messages checking in. The bonds are reinforced with lots of group projects. The professors team up too. The classes all combine different topics, like photography and geometry. Students often journal and talk about their lives. A strong learning community, service learning, independent research projects: these are what researcher George Kuh, founder of the National Survey of Student Engagement, calls "high-impact practices." His and others' research shows they make for more engagement and more persistence in college. This is especially crucial for adult students who, by definition, haven't been successful on a traditional educational path. 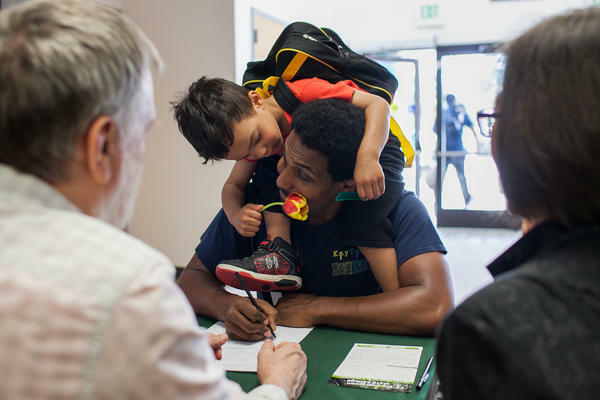 Evergreen's Tacoma Program is what researcher and former college dean David Scobey calls a "Great College for the New Majority" because it graduates adults at very high rates — with a culture of strong support. Mingxia Li has an M.D. from her native China and a Ph.D. in molecular pharmacology from Cornell. She's also a poet. This spring, she co-taught a class with Anthony Zaragoza on 21st-century diseases. It explored how our evolutionary past contributes to public health problems like diabetes, heart disease and even homelessness and gun violence. "I learned very quickly once I came here that the students here are quite different. They have life experience, work experience, and social experience that I don't know." Students love dissecting animals in her class, and she dreams that one day, one of them will decide to go to medical school. But this kind of deep learning goes against what's trendy for nontraditional students. Colleges that advertise to adult learners — say, on the bus — promise to put you into the latest, hottest technical jobs, quickly. When NPR published a story recently extolling the virtues of trade school (also in Washington state, as it turns out) it went viral. And the truth is, enrollment has been down here lately. The faculty has been cut from seven, to six, to just five members next year. "The bean counters don't understand what it is we do here," says Peter Bacho, who has taught many subjects including law and literature. Evergreen President George Bridges says that's not true. They are launching a rebranding campaign to try to attract more students. But, there are headwinds. Employment is up, so fewer people nationwide are heading back to school. The University of Washington is expanding enrollment in Tacoma, offering another four-year option with greater name recognition. And, working-class residents are being pushed out of this gentrifying neighborhood as prices rise in nearby Seattle. But for now, this place remains a refuge for the students who do find their way here. Like Kirby Christopher, who turned 60 the day after graduation. 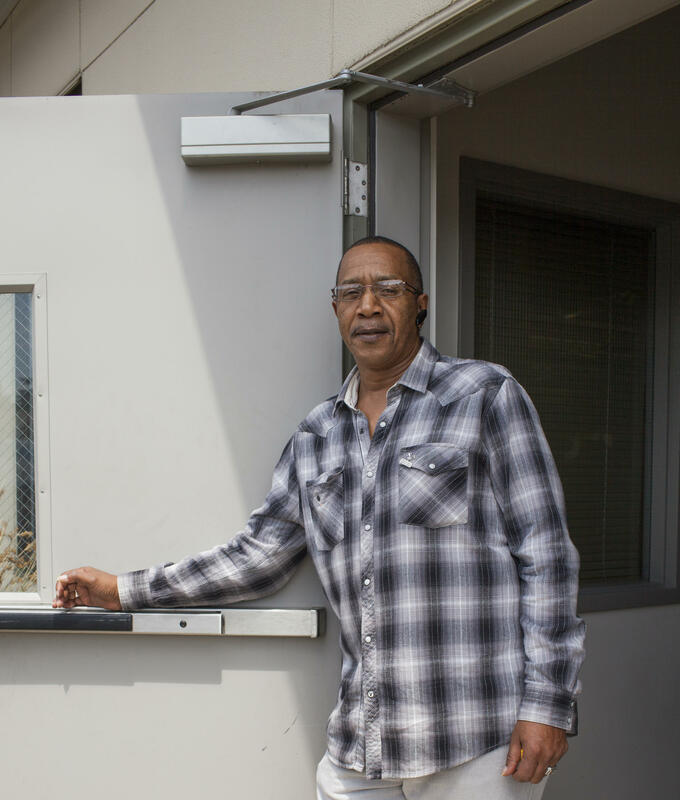 He originally dropped out of school in the seventh grade and spent years in and out of jails and prisons. Only one of his six siblings graduated high school. "Since I came here to Evergreen, Tacoma campus, my heart has got bigger," he says. Christopher says that coming here, meeting Tacoma students and professors, and reading authors like bell hooks has changed his life. He wants to serve his community as a caseworker for those with mental health issues. It's the kind of work the campus encourages in its motto: Enter to learn, depart to serve.